Five people, including at least three minors, have been arrested by French police over a Marseille bus attack in which a woman was severely burned. The police operation took place early on Tuesday, near the scene of Saturday's arson attack. Mama Galledou, a 26-year-old Senegalese woman, suffered 70% burns. She is being kept in an artificial coma. Prime Minister Dominique de Villepin has pledged to toughen France's anti-vandalism laws. France has seen a spate of bus attacks, a year after a wave of rioting engulfed its impoverished suburbs. 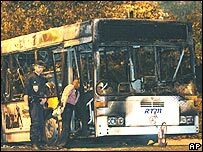 In most cases the gangs let passengers off the bus before setting it ablaze. But in the Marseille attack, a group of teenagers reportedly forced open the doors of the bus vehicle and threw an inflammable liquid inside before fleeing. Gangs of youths, many of them of North African origin, torched cars and clashed with police during three weeks of unrest last year. More than 10,000 cars were set ablaze and 300 buildings firebombed. Community leaders in run-down French suburbs have warned that the factors which played a key part in the riots - high unemployment, racial discrimination and alienation from mainstream society - remain unchanged. On Monday, the French government held an emergency meeting on transport security. Last year's riots were sparked by the deaths of two teenagers in a suburb of Paris. There is dispute over whether they were chased by police before they were electrocuted while hiding in an electricity sub-station.